You deserve to feel centered, healthy and heard. Come to Boston’s Ellementa Gathering to share wisdom and experiences with other women and learn from trusted experts. We’ll explore why cannabis and CBD are so compatible with the human body and how cannabis has been used to enhance women’s health for centuries. Come away from this event inspired and ready to transform your life. This month, we’ll talk about all of this plus cannabis and women’s emotional health. We are looking forward to seeing you. 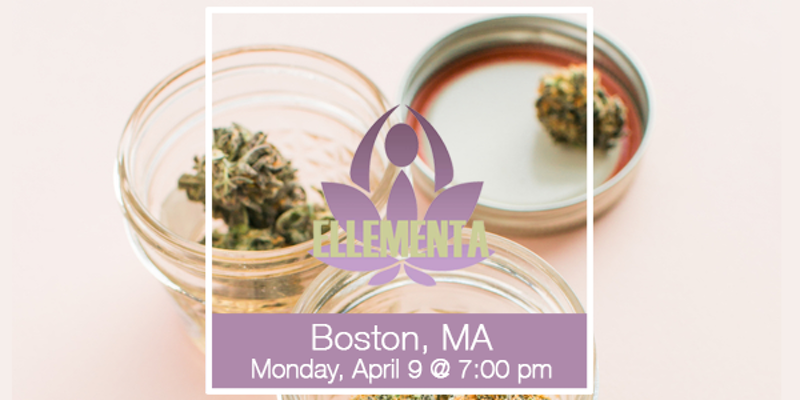 Ellementa meets monthly to bring women together to learn about cannabis for health, wellness, self-care and caregiving. This is a non-consumption, educational event for women/female-identified only. We create welcoming spaces where women can come together to speak openly about cannabis wellness. Janice Newell Bissex, MS, RDN is a culinary nutritionist, cookbook author, and holistic cannabis practitioner at JannabisWellness.com. Her mission is to help people who suffer from chronic pain, insomnia, anxiety, IBD, and other debilitating conditions find relief using cannabis. Ellementa Gatherings are non-consumption events. Ellementa does not condone consumption of cannabis on the premises of Gatherings. If consumption does take place at the event or any product is obtained at the event that is consumed after, attendees consume at their own risk and fully indemnify Ellementa, Inc. and its stakeholders from any responsibility. Everyone attending this event or other Ellementa events confirm they are 21 years of age or over and fully responsible for their own actions.